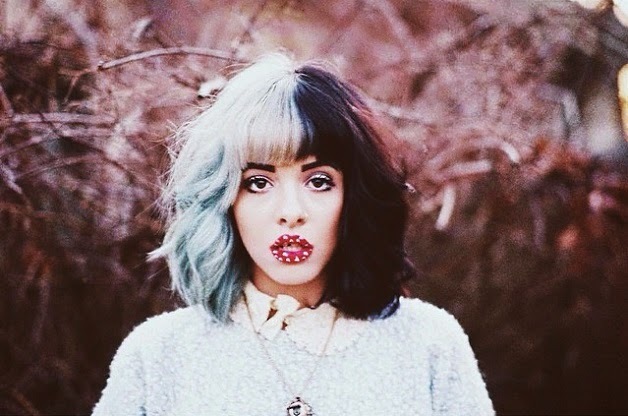 On May 20th, Melanie Martinez will release the eagerly awaited The Dollhouse EP. We spoke with her about the EP, the awesome first single, her hair, her time on The Voice, and her upcoming tour. I love "Dollhouse" and its video. They're both very dark. What was the inspiration for the song? It was actually the first session I had with Kinetics & One Love and we co-wrote that song. We just really wanted to write a dark story. That was the start of the whole vibe for the EP and the album. It's basically a dark story at the root, but it's kind of sugar coated with a childlike aesthetic--dolls, the dollhouse, the colors. It's all very childlike, but it's a dark story about a dysfunctional family. We thought that was a great start to something. It also has a double meaning for how I feel people view celebrities, how people put them in glass boxes and expect them to be perfect even though clearly they're all human. What can you tell us about the rest of the EP? They're all separate stories and what makes them all cohesive is the production and how every song has a dark story, but it's all very babylike almost. It's all honest stories that I would like people to put more attention on instead of writing about heartbreak and almost cliche-by-now subjects that everyone has been writing about lately. I just wanted to do something different and tell real stories that happened, whether it happens to me or whether it happens to someone I know. I just wanted to be honest with people and be able to tell them a different story than what they're used to hearing. You've been writing with a lot of talented people for your debut album. What have they brought to your songwriting process? I think they have allowed me to open up my mind more. I think every songwriter has these common, almost like tics, things they do a lot. A lot of my melodies are very "me." My brain doesn't allow me to think of crazier or different, way way different than I'm used to, melodies. Working with Kinetics & One Love helped me open my mind with melodies. They make me think about exactly what I want to say. It's been really helpful and really amazing because they're such talented people and they understand my vision. I've got to ask you a silly question. Let's talk about your hair. How long have you worn it that way? I've had my hair like this since a little bit before The Voice. At this point, is it almost considered a crime to even think of changing it? Yeah, I think it is. Honestly, I'm not at that point where I want to change it because I do change it all the time. I just change the blonde side. I put different colors in it always. I don't think I'm ever going to get sick of it just because I wouldn't want my hair to be all brown or all black. And I wouldn't want to bleach the other side because I know how damaged my blonde side is. I don't want to do that to the other side. I think I'm kind of stuck like this. Tell me about your time on The Voice. What was that like for you? You were what, sixteen years old at the time? I was sixteen when I auditioned and turned seventeen during the process. It was definitely a great experience. I'm very thankful for the platform and being able to show myself to the world. It was really great. It was a little weird to just be singing covers especially because I'm primarily a songwriter, so it was kind of hard for me a little bit. I'm just very excited now to be able to put out original music. It's been about a year and a half since your time on The Voice. How did you get from there to where you are today? I kept writing. I think I grew as an artist in the middle time between now and when I was on The Voice. I think now my music reflects my personality and exactly who I am. Before, my music wasn't quite there. It was definitely the soul and the core of what it is now, but I think that now it has an extra layer of frosting that made it the full package of how I want to portray myself to everyone. I'm really excited to put out this EP and album just because I can't wait for people to hear what I've been writing. You're eighteen. Where do you see yourself in five years? Everyone always asks me that question! I have no idea! I don't know. I'm hoping to be putting out a bunch of music and touring. If I have it my way, I would just tour and write and put out music forever. That's just what I love to do. I just want to keep doing what I'm doing, just hopefully on a bigger scale. Your tour you're starting in June, is that just you and a guitar or are you going to have a full band with you? Yeah, I have two guys that are going to be with me. It's definitely transitioning to electronic. It's all samples from the actual tracks and the sounds that are on it. I think it's just cooler for people to hear it live exactly how they hear it on the track. That's how they should hear it. That's what they know. That's what they want to come for. Finally, we have one question we ask every guest. You're in charge of a music festival and get to pick five other artists, living or dead, to appear on the bill with you. Who do you choose? Wow, that's a great question. That's interesting. I've never heard that question before. I'm debating if it would be an all-girl thing. That's like my hardest debate right now. I think it would be very diverse. I think it would be Neutral Milk Hotel, CocoRosie, Bjork, Lana Del Rey, and Biggie. Cool! What song do you all perform as the finale? "It's My Party," Lesley Gore.